Get some historical perspective at St. Mark's Square and St. Mary of the Friars. Your cultural itinerary includes sights like Cannaregio and Scrovegni Chapel. Step out of Venice with an excursion to Basilica di Sant’Antonio - Basilica del Santo in Padua--about 42 minutes away. And it doesn't end there: contemplate the waterfront views at Canal Grande, steep yourself in history at Ponte dei Sospiri, take in the views from Ponte di Rialto, and admire the landmark architecture of Basilica di San Marco. For ratings, other places to visit, reviews, and tourist information, read Venice travel itinerary creator. Washington DC, USA to Venice is an approximately 19-hour flight. The time zone changes from Eastern Standard Time (EST) to Central European Time (CET), which is usually a 6 hour difference. Traveling from Washington DC in May, expect nights in Venice to be about the same, around 56°F, while days are slightly colder, around 71°F. 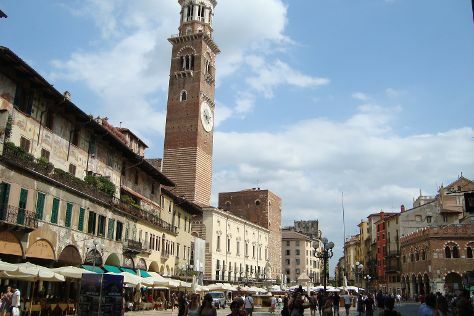 Wrap up your sightseeing on the 11th (Thu) to allow time to take a train to Verona. On the 12th (Fri), take in the spiritual surroundings of Basilica di San Zeno Maggiore, step into the grandiose world of Castelvecchio Museum, make a trip to Piazza Bra, then make a trip to Piazza delle Erbe, then take in the spiritual surroundings of Chiesa di Sant'Anastasia, and finally listen to music at Arena di Verona. To find other places to visit, maps, photos, and other tourist information, read our Verona holiday planner. Traveling by train from Venice to Verona takes 1.5 hours. Alternatively, you can drive; or take a bus. Expect a daytime high around 75°F in May, and nighttime lows around 56°F. Wrap up your sightseeing on the 13th (Sat) to allow time to take a train to Florence. Deepen your sense of the past at sights like Historic Centre of San Gimignano and Piazza del Duomo. Get some cultural insight at Galleria dell'Accademia and Piazzale Michelangelo. Change things up with a short trip to San Gimignano 1300 in San Gimignano (about 58 minutes away). The adventure continues: examine the collection at Uffizi Gallery, get to know the fascinating history of Piazza della Signoria, explore the world behind art at Pitti Palace, and take in the spiritual surroundings of Abbazia di San Miniato al Monte. For ratings, photos, where to stay, and tourist information, go to the Florence itinerary builder. Take a train from Verona to Florence in 1.5 hours. Alternatively, you can drive; or take a bus. In May in Florence, expect temperatures between 75°F during the day and 53°F at night. Cap off your sightseeing on the 15th (Mon) early enough to go by car to Assisi. Do some cultural sightseeing at Basilica Papale San Francesco D'Assisi and Rocca Paolina. Deepen your sense of the past at sights like Eremo delle Carceri and The Tower's Bridge (Ponte delle Torri). 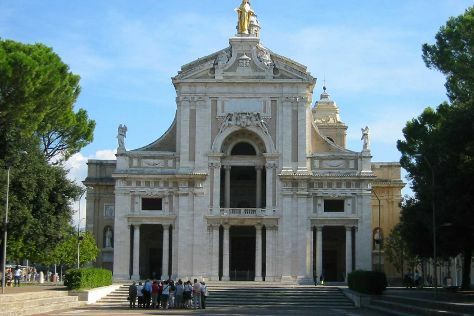 Step out of Assisi to go to Spoleto and see Cathedral, which is approximately 42 minutes away. There's still lots to do: Head underground at Grotte di Frasassi, make a trip to Porziuncola, pause for some serene contemplation at Chiesa Nuova, and contemplate the long history of San Damiano. To find more things to do, traveler tips, reviews, and other tourist information, read our Assisi itinerary builder. You can drive from Florence to Assisi in 2 hours. Alternatively, you can take a bus; or take a train. In May, daily temperatures in Assisi can reach 74°F, while at night they dip to 51°F. Finish your sightseeing early on the 19th (Fri) so you can drive to Rome. Museum-lovers will get to explore Vatican Museums and St. Peter's Basilica. Get a sense of the local culture at Palatine Hill and Pantheon. Step out of Rome with an excursion to Ostia Antica in Ostia Antica--about 44 minutes away. There's much more to do: don't miss a visit to Piazza Navona, take in the architecture and atmosphere at St. Clement Basilica, admire the local landmark of Trevi Fountain, and contemplate the long history of Roman Forum. To see other places to visit, reviews, where to stay, and other tourist information, refer to the Rome vacation planner. Traveling by car from Assisi to Rome takes 2.5 hours. Alternatively, you can take a train; or take a bus. Expect a daytime high around 75°F in May, and nighttime lows around 56°F. You'll have a few hours on the 22nd (Mon) to wrap things up before traveling home.